Rated "#1 Winery in the Northeast"
An impressive rating by Wine Report for five years in a row! 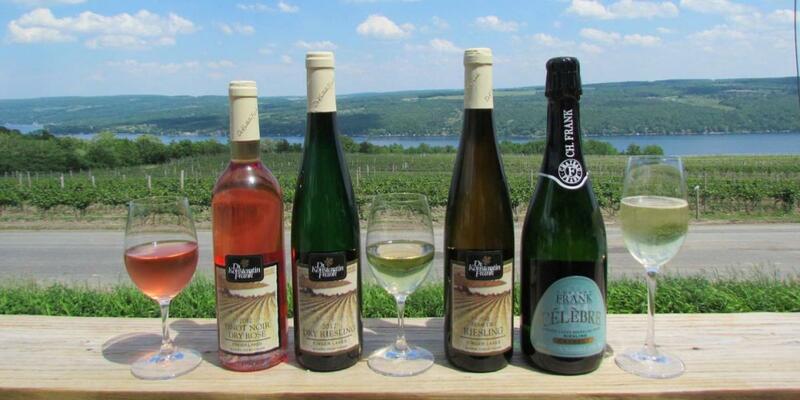 Dr. Konstantin Frank Vinifera Wine Cellars, Ltd., helped put the Finger Lakes on the map for best wine regions. Dr. Frank ignited the "Vinifera Revolution," which permanently altered the course of grape growing in the Finger Lakes and in the United States. At one time, Dr. Frank was growing 60 different types of grapes found throughout the world, in an effort to achieve his dream of "assembling the world's greatest wine grapes." Dr. Frank proved to the world that European Vines, called Vitis Vinifera, could be grown in the Finger Lakes Region. He founded his winery in 1962, merely a decade after immigrating to the United States from the Ukraine. After observing grape growers in the Finger Lake Region planting acres of French-American hybrid grape varieties, Dr. Frank inquired about Vitis Vinifera varieties. He wondered why growers were not planting European grapes such as Chardonnay and Riesling. He was told Finger Lakes winters were far too cold for those varieties to survive. Dr. Frank had experience growing Vinifera varieties in the Ukraine, "where the temperature goes to forty below, where we had to bury the entire vine in the winter, and where when we spit, it froze before it hit the ground." 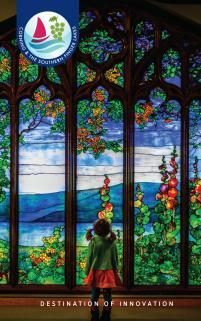 He knew the cold climate was not the issue, but rather diseases like mildew, fungus, and vine pests. Modern technologies could easily control these problems. When the president of Gold Seal Winery, Charles Fournier, heard what Dr. Frank had to say, he realized there was a great possibility he could be right. 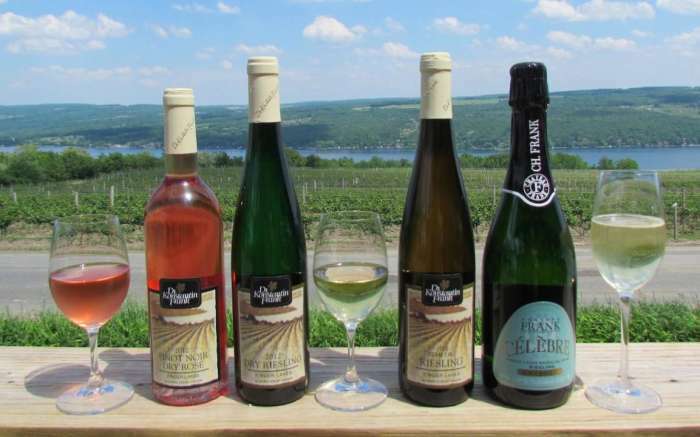 Fournier had seen Pinot Noir and Chardonnay varieties at Rheims and Epemay, which are seven degrees of latitude farther north than Hammondsport. In 1953, Fournier hired Dr. Frank as a consultant to Gold Seal. Together, they grafted thousands of Vinifera vines onto Canadian rootstock over a four-year period. Varieties included Chardonnay, Gewuüztraminer, Cabernet Sauvignon, and Riesling, obtained from the University of California at Davis. Dr. Frank bought property for a vineyard on Middle Road in Pulteney and planted his own vines. By 1973, Dr. Frank's Vinifera Wine Cellars, Ltd., had expanded to seventy-eight acres of vineyards and had a winery capacity of 60,000 gallons. His Trockenbeerenauslese 1961 was served in the White House and in the executive mansion in Albany. 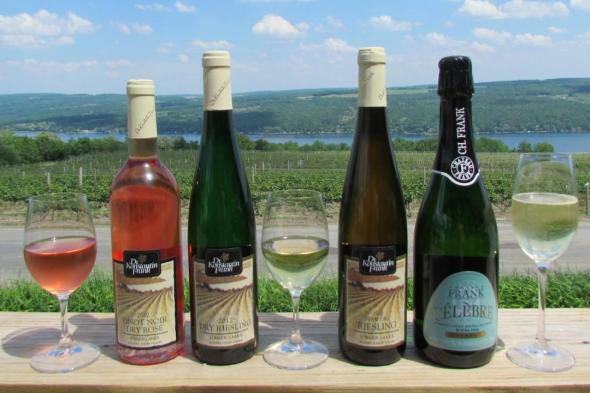 He built his Finger Lakes winery behind his home and maintained a small pilot vineyard, including at least two vines each containing nearly fifty varieties, or clones. Some little-known varieties he planted included Kara Bumi from Bulgaria, Fetjaske from Hungary, and Sereksia Tschomay from the Ukraine. When Dr. Frank died in 1985, his tradition was carried on and expanded upon by his son, Willy, who passed it to his son, Fred. Fred asks the same question that his grandfather asked: "Why not the best?"